The Shellmo project brought me back to my 3D printer which sits in the corner for 6 month without use. I dedusted it and started printing with a cheap 3 mm red ABS yesterday. By "chance" I printed the first baking tray with 0.5 mm layer height. Quite good enough for most parts but faster than with a smaller layer height. 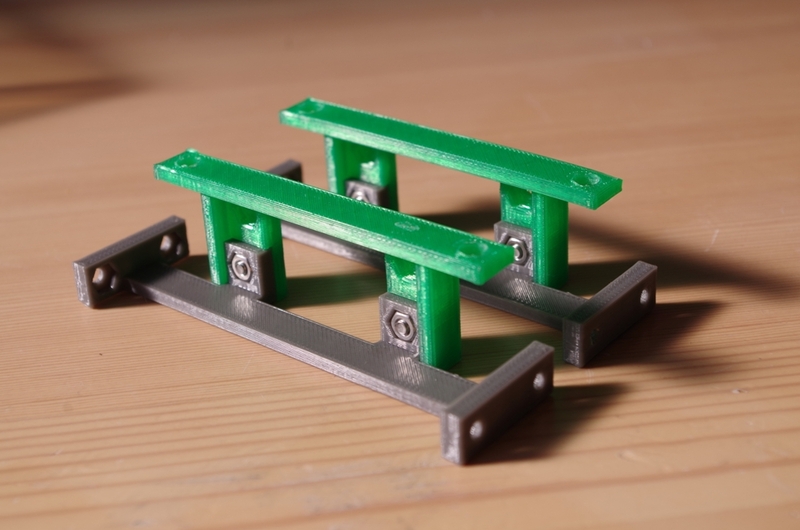 Only the frames with the integrated axis = Frame BL and Frame BR where printed with 0.25 mm layer height because of strength and smoothness of the axis. Everything fits together perfect. I only had to re-drill the 3 mm holes - but this is normal and better than having to big holes. Sho - you did a great job! Even if the snap in links are snapping in perfectly I have some doubt if this will last long? From the point of view of the "manufacturer" it is stupid to divide the chassis into 8 separate parts with 12 screws and nuts. But this concept has two advantages. It is easy to print at home because of the minimum danger of warping of the smaller parts and the possibility to reprint parts if something went wrong during printing or in use. Additional this design makes it easy to change the individual part design without the need of reprinting everything. So I plan to use this hacked servo motors instead of Sho's geared motors because RepWalker should walk soon on my desk. Good 3D printing quality ! I found your mistake of attaching FrameC to FrameA. Please see this picture. (04-19-2014 08:26 PM)sho Wrote: Good 3D printing quality ! (04-19-2014 08:26 PM)sho Wrote: I found your mistake of attaching FrameC to FrameA. I have finished my servo mount adapter and integrated it in Sho's frame. The crank is glued to the Servo disc with double sided tape. I tested it with the arduino and a software out of the web which let you control the servo via the serial monitor. With this I "killed" already two crank pins at the wheels. I found out that because of my pour printing quality of the crank pin the link get caught by the pin and has broken it apart. I have glued it together with Acetone and hope to make some more test runs later. To make this design fool prove, I would suggest to make the link with two closed bearings and use the good pin design with the c-rings for securing the link. I surprised you made it very fast ! And I'm happy your modification works well. How do you want to modify next ? Did you find any problems when print and assemble RepWalker ? I have to rework my servo frame. Some measurements must be changed to ensure a nice fit and a trouble free run of the gear. I will reprint it with better ABS and only with 0.25 mm layer height. When I tighten the screws two of the nut holder break apart. This might be because of my bad ABS or because the design is to weak - maybe both? I would enforce everything a little to make it "home printable". I don't think that we have a problem with weight or material costs. Why not making the crank pin Ø 5 mm instead of 4 mm? Why not closing the link at both ends. Do you have editable files for the parts? Here is the sketchUP files that you can edit. I used sketchUP for designing RepWalker. I used your Sketchup files to measure out the parts. Now I have redrawn it in my CAD. The result looks similar. I changed the crank pin and main axis from 4 mm to 5 mm to give it more robustness - OK- looks not that fine like yours - but I want to get a test base for the electronics and she shell. My crank pin at the left was printed to fast and it has no ficture for the link. Was only a test for comparison of the wheel designs. Is there any hidden key geometry trick in this wheels? For this I will redesign the complete chassis. Sho, please give me the measurements/coordinates of the 4 connecting point between the chassis and the shell. This is still the old 4 mm crank pin. Will change this to 5 mm also.